This weekend Aunt Sissy brought cousin Juliette to visit Alice. 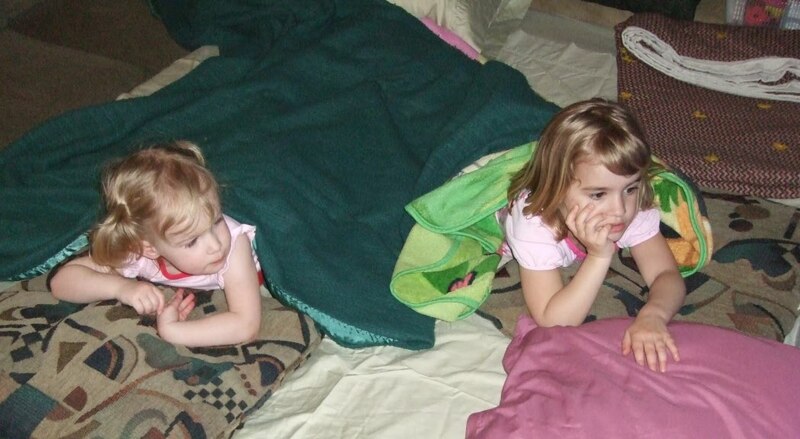 This was the first time Alice has been old enough to really play with her cousin. Juliette is just over 2 years older than Alice, and Alice thought she was the coolest. The two girls played great together. 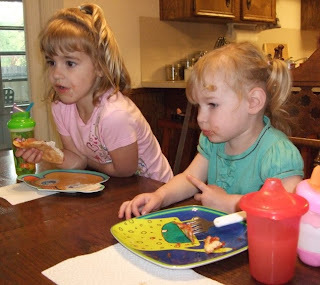 Juliette was gracious in understanding that Alice was younger and giving in to her two year old demands. 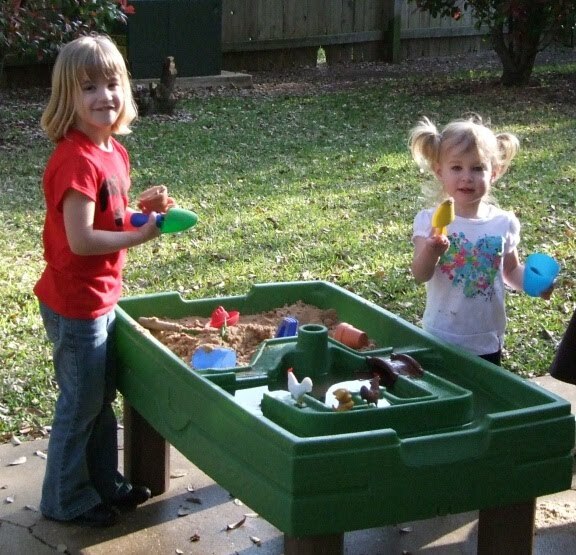 Alice was good in letting Juliette play with her toys without saying "mine" to everything. Aunt Sissy brough Alice the play kitchen Joci and Jules have loved for several years. Now Alice has her "New Kitchen". 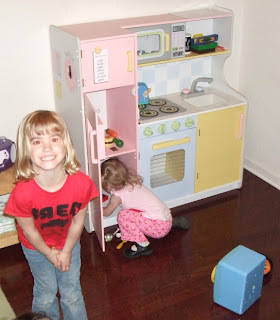 The first night, the two girls plays together in her room with "the New Kitchen" for several hours. Juliette showed Alice how everything worked. After they played themselves out in the "New Kitchen" the girls retired to the TV room and watched several episodes of Max and Ruby laying together on the blow-up bed. Alice kept telling Daddy to "go-way daddy"....she was hanging out with her big cousin Jules, and didn't want us hovering. Bed time was very late for the two girls. Alice finally agreed to go to her bed around 10:00. The next morning we went for the Bickel tradition of driving around eating donut holes and coffee. We happened past a couple garage sales, and I picked up a couple of toys for Alice and some for Patra's boys. Around 11:00 we headed downtown. 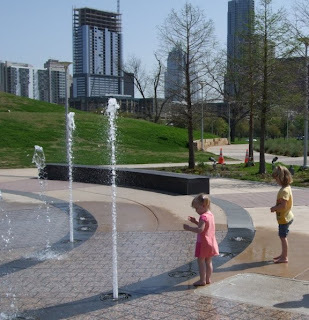 Our original plan was to go ride the Zilker Park Train, but there was an event going on and crowds and parking conspired against us. Instead we took the girls to the Parmer Event Center Park. They have a spiral hill and water park/fountain. Alice absolutely LOVED the fountains. She ran around and got wet and splashed in the shallow pools. Of course, some strange little boy started following her around (this often happens, especially at McDonalds Playlands). Jules got to ride her scooter down the spiral hill, and also got a bit wet. Love, love, love, seeing the girls together and knowing they had a good time!